Spot-a-Cop is seeking admins to help run our West Virginia, Ohio, Pensylvania, and Maryland chapters. Likewise, we are seeking new admins to help us with new chapters in various areas. We are also seeking admins to help with our newly launched Va. Beach chapter. If you are intersted in joining the team, CLICK HERE." Join our Team / Join the Network / SaC History / SaC's Community Center / Your Rights NEW!!! What is Spot-a-Cop Mission Statement Spot-a-Cop's SOP SaC Open Forum Spot-a-Cop Chapters How to Start a ChapterSaC's Community Center NEW!! !SaC's Services NEW!!! We took to the streets with AFK, The Peace Keepers of Virginia, and the #StandVa movement. Rob Kapp, a boots on the ground freedom fighter and activist coordinated an event. He spoke with the media and handed out pocket Constitutions while spreading the news about rights, the fight for the ranchers in Nevada, and our 1st & 2nd amendment rights. Several organizations and people participated. Even children and passerby's joined in as the groups waived flags and greeted community members. 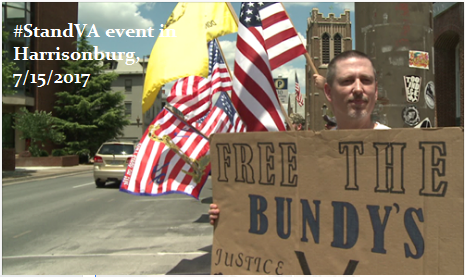 It was a qite to see, set perfectly in front of the Federal Courthouse in downtown Harrisonburg on July 15th, 2017. The event was planned to start at noon but supporters arrived early, anxious to do some good for the community. 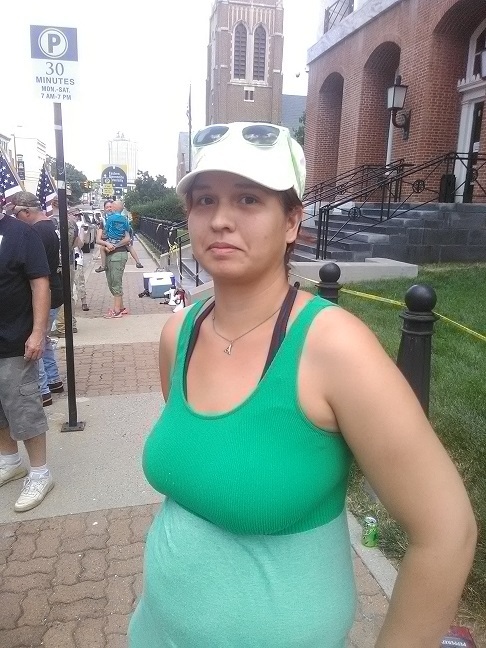 Several people were on hand like Lea Gale Blake of the AFK group, who drove all the way from Richmond for this event. Rob Kapp gets a few interviews from the patriots. Jason C. Kubin provides his insights. Children were even involved. Kaleb Kapp is seen here flying flags. It's a wonderful thing that tomorrows generation is learning about important lessons in relation to our Constitution. Sigrid Anderson also came out to help represent the Spot-a-Cop organization. She too gave an interview. SaC's founder, Jason C. Kubin was proudly supporting the cause. Freshly released from jail, he was eager to jump right back into his role as a leader and activist, fighting for his community and country. The event started out slowly but more and more supporters showed up. A call to arms was made to SaC to get more supporters to come on out. Likewise, The Peace Keepers of Virginia were also active in trying to increase the amount of supporters. The general of PKV walks in front of the pack, proudly waiving the colors of freedom. The front line in virginia was a beautiful sight as patriots stand tall and proud in defense of this country. 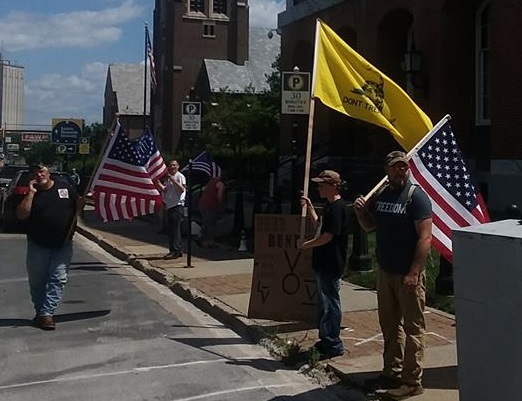 Even local community members came across the event and jumped in to be counted and to stand against tyranny and a corrupted federal government. This young lady's very first action after being released from jail was to stand for freedom. Bravo! Eventually, all the groups came together. The wall of patriots grew and the vibrant colors of freedom yet waived again. 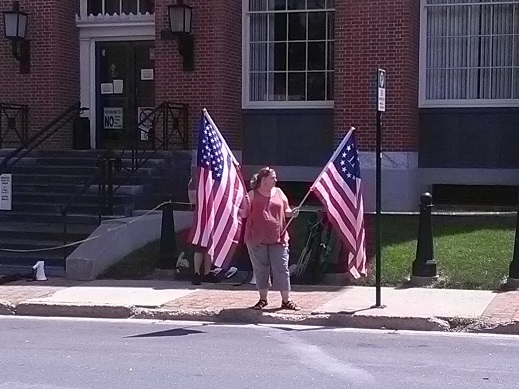 Gaining support by passing motorists, the groups of patriots waived their flags high in an almost revrent fashion. The event caught the attention of the media. WHSV TV3 came out to cover it and Rob Kapp provided an indepth interview. Here's what TV3 reported. HARRISONBURG, Va. (WHSV) — "Mainstream media doesn't report a lot on this. You don't hear a lot about it." 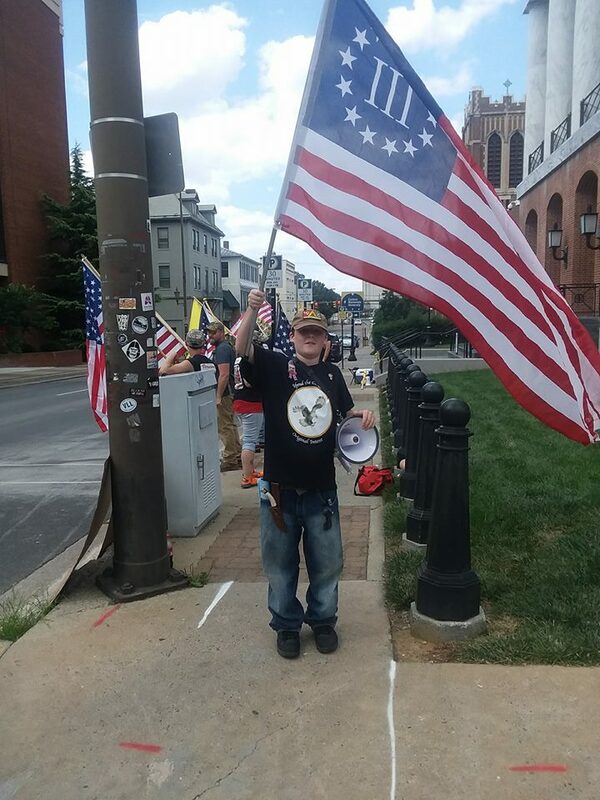 Those were the words of Robert Kapp as he held an American flag outside the federal courthouse in Harrisonburg on Saturday afternoon. The Broadway man was among a dozen or so other demonstrators who came out to show their support for four men headed to trial in Nevada. They're facing decades in prison for bringing assault-style weapons to a confrontation that stopped government agents from rounding up cattle near a ranch owned by Cliven Bundy in 2014. Kapp, who said he started becoming interested in activism a year-and-a-half ago, said the case represents an intrusion on the rights to free speech and firearms. "Our rights, our freedoms, our liberties are on trial right now," said Kapp. "The government is trying to take away our right to defend ourselves and to make a stand against them. A lot of laws are really aren't just. They're not fair. Many of them violate the Constitution and our basic rights." The group handed out pocket-sized versions of the Constitution to those passing by on N. Main St.
Kapp said the feedback from drivers ranged from positive reactions to some using obscene gestures. "Just because it's going on in Nevada doesn't mean it's not going to happen here," said Kapp. The armed standoff between the U.S. Bureau of Land Management (BLM) and supporters of cattle rancher Cliven Bundy gained nationwide attention three years ago. The government obtained court orders directing Bundy to pay over $1 million in fees for use of federally owned land. On Monday, jury selection began in the retrial of the four men. In a previous trial, a jury found two other men guilty on some charges, but failed to reach verdicts on the rest.